In the wake of Hurricane Matthew and Cuba’s brush with disaster in early October (only the country’s eastern edge caught the full power of the winds that decimated nearby Haiti), a local newspaper headline read ‘The Caiman was Saved by Providence’. The caiman in question is Cuba, named by the region because the country’s outline resembles a crocodile. This ‘friendly beast’ that rides its luck in stormy waters is currently opening up to the US and the rest of the world, and it is interesting see how things are shifting. I was last in Havana in 2000 for that year’s biennale, and the developers have arrived in the interim, restoring the old colonial villas of the capital’s suburbs. Some of the previously aristocratic areas in the west of the city that were transformed after the revolution into social housing projects are now being changed into apartments for tourists, while the blocks in Old Havana that Fidel Castro preserved in aspic are becoming a central shopping district. The rhetoric of cultural officials acknowledges this ideology of contradiction, between strict government control and economic liberalism, and in many respects Cuba is the reverse of the HyperNormalisation outlined by Alexei Yurchak in 2006, popularised by documentary filmmaker Adam Curtis in 2016, which describes a 1970s socially petrified USSR. In Cuba everyone plays along with the government’s attempts at control, yet they can quite easily imagine the alternative reality to the official facade. A university professor, for example, can earn his month’s salary of 30 CUCs in half an hour as a cab driver, and the population, many of whom are dressed comically in stars and stripes, now wait patiently for the new influx of visitors to arrive and the unstoppable dollar. Two years ago 100,000 US ‘visitors’ entered the country (Americans ‘tourists’ are not officially allowed in until next year), while last year the figure rose to 800,000. In 2017 it is set to hit 4 million. In art critical terms, my visit coincided with AICA’s annual international congress, with Havana chosen for its transitional context on a physical and symbolic level. In relation to the situation outside, the question posed for the main symposium ‘New Utopias: Art, Memory and Context’ seemed strangely out of kilter. Keynote speaker Robert Storr, however, threw a cat among the pigeons straight out of the blocks by reminding US citizens of their own revolution and stating that he thought of America in a hemispheric way, by which he meant that all of its citizens are post-colonial and mixed race. As a rebuke to the potential of any rose-tinted idea of the future (in Cuba or elsewhere) – utopias are usually reified counter-arguments to other previously reified ideologies – he outlined how he preferred to be a realist with the idea of the ‘absolute particular’ (meaning specific artworks) holding an answer to social change, because they provide a distinct position from which to question the ‘ideal’. With one elephant in room for Cuba being Tania Bruguera (Interview AM400), who has persistently been targeted by the government for her critical position, Storr wasn’t shy about naming her recent work as exemplary, not simply for its antagonism but because it is genuinely thought-provoking. In a wonderful poke at mainstream politics and art criticism, he pointed out that too much criticism is handicapped not only by the market but also by the academic search for the ‘zinger’ (a side-swipe at the antagonistic pettiness that dogged the recent US election) from ‘wannabee university professors’ or those wanting to defend small positions or territories. Instead, at a time ‘when the stupids are on the march’ (again meaning Donald Trump et al), he suggested that we need to elevate discourse to its clearest level through ‘description’, because one way to stop extremists is for specialists to talk to non-specialists. When utopias, and especially dystopias, are mesmerising the political establishment to a dangerous level, it is clear that the simple act of description becomes a political act, and Michael Asbury and Cristina Freire’s clear presentations concentrated on related art histories, institutions and architecture in Brazil, which had moved from a utopian to a dystopian project over a 50-year period. Through her analyses of the 2016 Olympics-inspired Museum of Tomorrow in Rio, which has an archaeological archive of slavery from the nearby Valongo Wharf held in its basement, Freire’s critique of clumsy high museum design favours Helio Oiticica’s favela style and temporary gestures such as the artist’s Parangole as a form of popular art. Asbury meanwhile, also an expert on Oiticica, paid tribute to Mário Pedrosa who organised the AICA congress of 1959 that coincided with the Cuban revolution in his paper ‘Brasilia: Anachronism of Utopia’. In part, this showed how Oscar Niemeyer’s modernist architecture and public art for Brasilia exploited thousands of indigenous people who set up workers’ camps that eventually became satellite towns to the country’s capital city. Damian Smith’s presentation ‘Barefoot Curating’ set out on a practical note. As an Australian living in Cuba, he has developed an intimate relationship with Havana’s community and the old Hershey Train Line (Cuba was the US chocolate company’s pre-revolution sugar provider), the location of his curated section for 2018’s 13th Bienal de Habana. Its potential, literally as a vehicle for new cultural links enabling periphery-to-periphery discourse, is exciting because it aims to connect local political and cultural histories with their international counterparts for the first time. Visits to government-approved locations included Los Carpenteros’ studio, situated in Fidel Castro’s former personal doctor’s house in a relatively middle-class area of the city. Our guide announced that the building is soon to become a research centre for curating and theory, as well as a library of contemporary art, yet inquiry completely free from manipulation by the regime seems unlikely. A community centre in an especially deprived area of Havana, set up by the artist Kcho, also created conflicting feelings of both inspiration and alarm, not least because the artist has recently become a member of parliament. The centre, which was opened by Castro in 2014, has a noble plan that goes way beyond Los Carpenteros’ studio. ‘The aim of the project is to change the way of thinking and the way of acting of the whole Cuban people,’ one of the young organisers told me in a bright-eyed manner, which reminded me of another statement by Storr: ‘in politics you need to have policies, but in art you don’t, you only need to stimulate change.’ It will be interesting to see which camp this latter organisation eventually falls into, or if both initiatives prove successful, as they sit precariously within a scenario of rigid government control and artistic freedom. 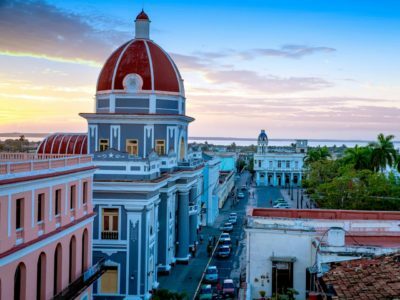 Outside the congress, I scoured Havana’s suburban arts centres, music clubs and bars to socialise with locals desperate to connect. One man incensed by Brexit spoke about island mentality in relation to the scenario that Cuba was starting to open up at the same time the UK was creating barriers in its own region. Our conversation shows that, despite the careful regulation of culture, citizens in this country are well informed, and any ‘utopian’ hopes at present are simply for a more transparent and stable future. Ironically, it was Thomas More who coined the term ‘Utopia’ with his 1516 book by the same title that imagined a perfect society on a fictional Caribbean island. Cuba is the only country in the world that has managed to sustain socialism against massive external pressure. It will be interesting to see how its citizens map the near future in both art and politics with integrity and clear critical rigour, free of simplistic ‘zingers’, ambivalent narratives or white propaganda. Andrew Hunt is co-director of Reading International and a research fellow at Kingston University.